As far as baking is concerned, muffins are one of the easiest delicacies to make. At least, that’s what I’m told… I still get nervous when following the only golden rule of muffins – minimize mixing, because I once wound up with some powdery flour dispersed in the crumb. It was a disturbing experience. But, in the name of bringing sweetness to our lab meeting, I sucked it up and baked a batch. Heat oven to 375 F. Coat a 12-cup muffin tin (each muffin about 1/2 cup) with oil, or line it with paper cups. In one bowl, mix all dried ingredients: flour, baking powder, baking soda, and salt. Stir to combine. Beat the butter with the sugar and the lemon zest in an electric mixer in medium-high speed until light and fluffy – about 2 minutes. Add the eggs, one at a time, beating well after each addition. Beat in half of the dry ingredients, then one third of the yogurt. Beat half of the dried ingredients, alternating with the yogurt, until every thing is incorporated. Do not overmix. Add the tablespoon of flour to the blueberries, and fold them in the muffin batter. Divide the batter among the muffin cups, bake for 20 to 25 minutes, until golden brown. Set on a wire rack to cool, un-mold, and serve. Comments: For reasons that escape me, I didn’t care for blueberries until a few years ago. At home, the official pancake maker always had a few blueberry-free flapjacks ready for me. Suddenly, after a blueberry pie or other blueberry treat (I don’t exactly recall), I fell madly in love with them, and now indulge in every opportunity. A small bowl of blueberries topped with Greek-yogurt and a swirl of agave nectar is just dreamy, and perfect late in the evening while watching Law and Order (why, oh why did they can that show?). 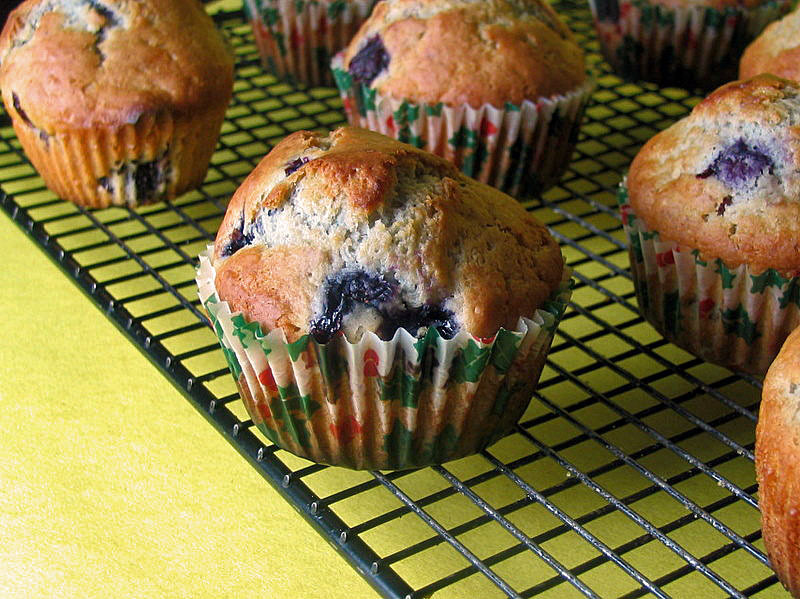 Back to blueberries: these muffins are delicious indeed. I still need to perfect the mixing, to make them “light-as-a-feather,” but I’m getting there. The next batch might be it! The ingredient list for these muffins tell me that they must be fabulous, so I must make them! “Beat the butter with the SUGAR and lemon zest until light and fluffy…(not with the eggs, as the eggs are added in Step 2. Thanks for sharing…love your site and emails! Congratulations, they look extremely desirable! Was going to suggest one of those danish dough whisks (made somewhere in Eastern Europe) but available from Breadtopia for that light mixing thing for these. A spooky bit of kit that does the minimal mixing without leaving those bits of stray flour. I think KA does them too but charges a lot more for their logo up the side of the handle. Would you believe I have one of those whisks and did not think about using it?